Brenda Sutton started playing bodhrán in1989 when she stumbled upon a small group of sessiun musicians playing regularly at McDuff's Irish Pub in Atlanta. A kind, patient, dedicated bodhrán player, Peter Blaney (the Comhaltas Ceoltóirí Eireánn Western U.S. Division Champion), took her under his wing. 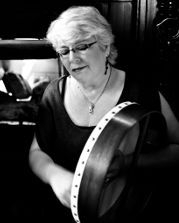 Brenda has spent over 25 years finding and mastering all 42 notes on the bodhrán, and has developed her own unique brushed-tipper style. She is an award-winning singer/songwriter, performing with the traditional Irish trio Alair, as one of the four Three Weird Sisters, and in the Irish pub band Bed 'n' Breakfast. Please visit Brenda's website for more information on all things bodhrán.